Indecisive? Maybe. I prefer to think of it as spontaneous. As I was planning my road trip from Arizona to Sonoma, California, via Yosemite, I changed my mind about the route numerous times. Allotting myself about five days to get to San Francisco, and then on to my son’s wedding in Sonoma, I knew that my road-tripping time would be limited. I needed to be strategic! Still, I would be traversing some of the world’s most beautiful territory. Could I really skirt it? 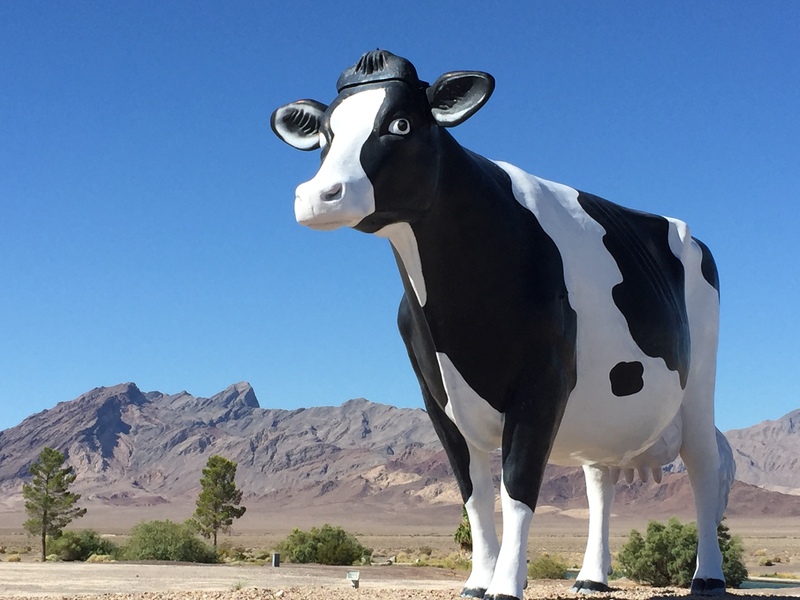 Finally, practicality won out, and I settled on a route that would take me to Las Vegas via I-40 and Highway 93, then north on Highway 95 to Tonopah, Nevada, and west to Yosemite. It was the quickest route, and one that came up consistently as the first alternative on the major mapping sites. I screen-shotted it, and texted it to my son. Done deal. 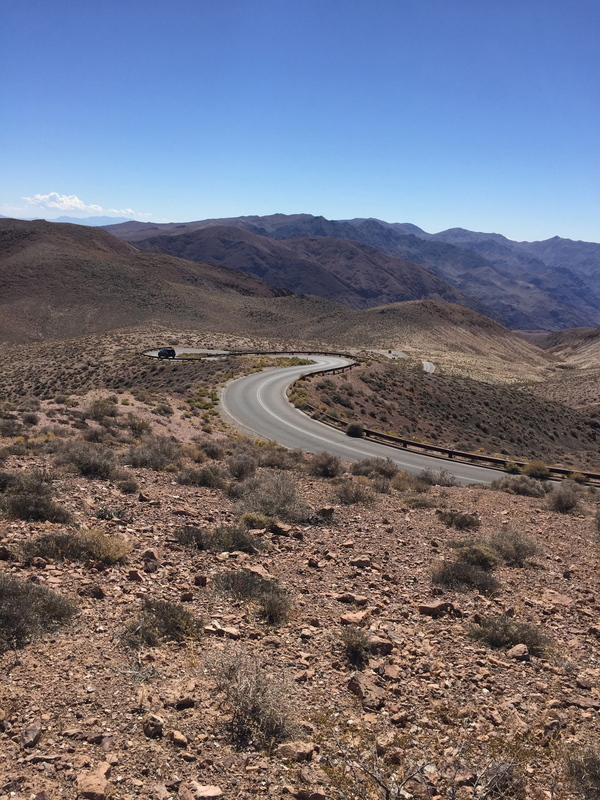 A few days before I left, however, I was talking with a coworker, who pointed out that the long route north through Nevada was a little devoid of scenery. He suggested instead that I head west soon after Vegas and link up with Highway 395, which would take me north on a corridor that fronts the Sierra Nevada Mountains to the west. 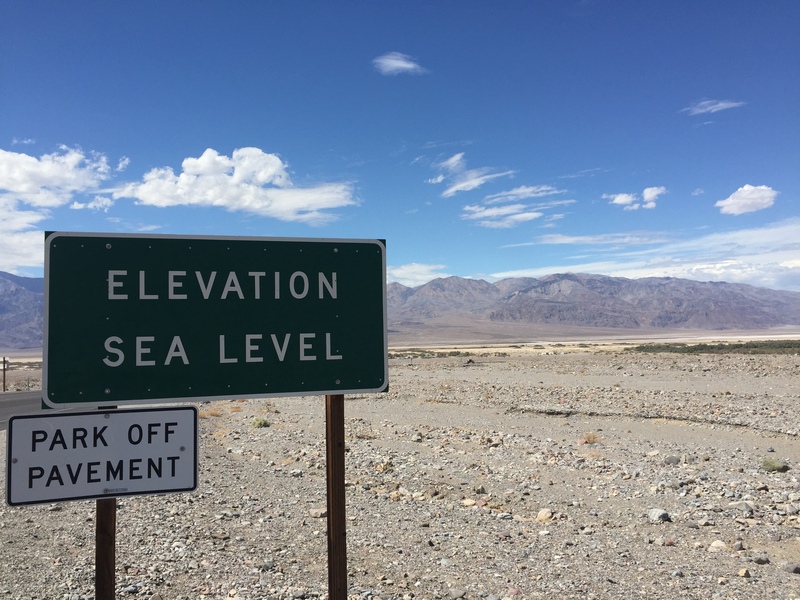 An added benefit: I would go through Death Valley, the iconic sub-sea-level national park in central California. The more I looked at my map, the more I thought it was doable. Even though I was a little worried about the time involved, Google and Mapquest both indicated that the new route would be just minutes longer. 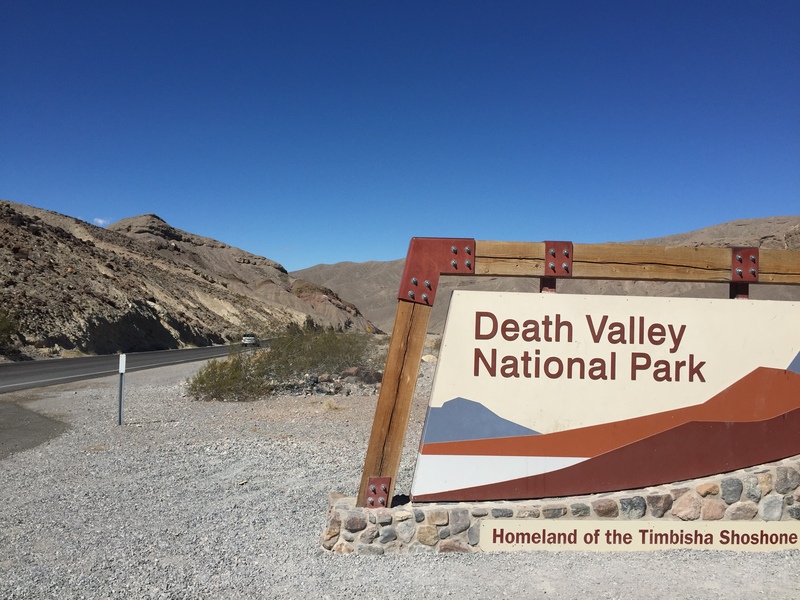 So, after spending the night in Vegas, I headed north on Highway 95 , and then south on Highway 373 toward Death Valley Junction. Good choice, as it turned out. The only problem – the detours within the detours. Soon after entering the park, I took the 13-mile route up to Dante’s View. It was a fairly steep, twisting road, but I was gambling that the payoff would be huge. Win! With dramatic drop-offs on all sides, the viewpoint offered sweeping views of the deep, bleached valley spread below. And at nearly 5,500 feet elevation, Dante’s View was relatively cool. I hiked the trails to the lookouts in both directions, and just soaked it. I’ll have to say, I had never seen anything quite like it. 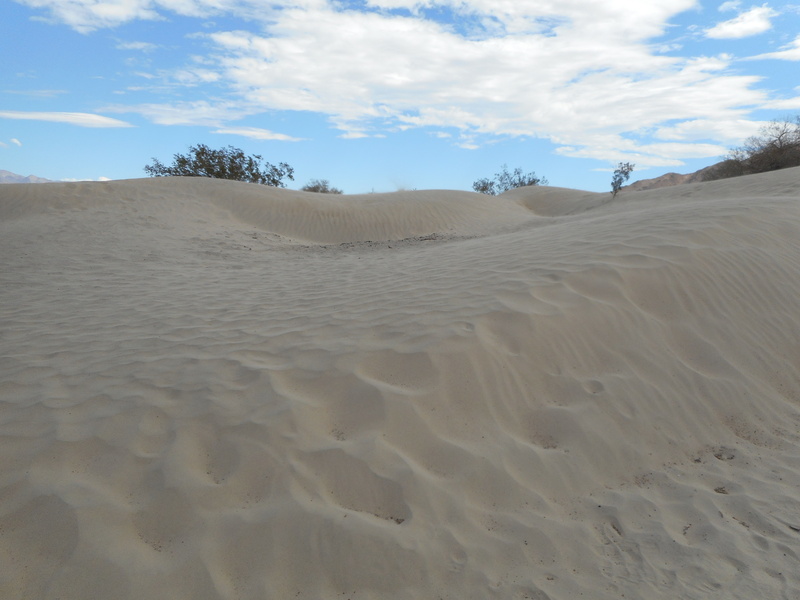 The next minor ‘detour off the detour’ involved the Mesquite Sand Dunes. 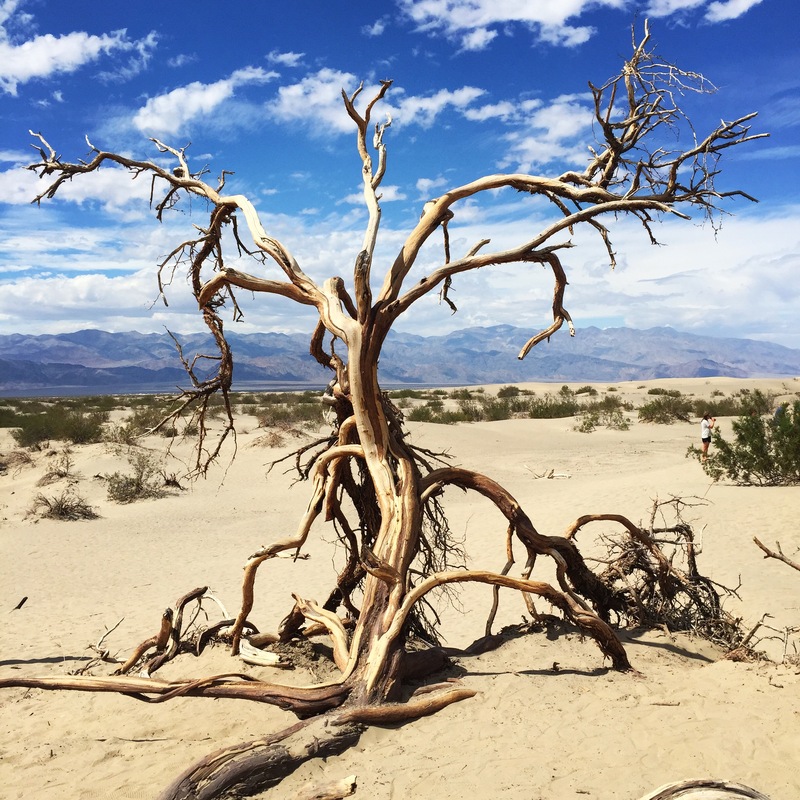 It’s pretty much right on Highway 190, so it doesn’t require any extra driving, but I ended up spending about an hour there, walking over the blazing-hot dunes, looking at the weathered old dead trees and the drifting sand. It was lovely. 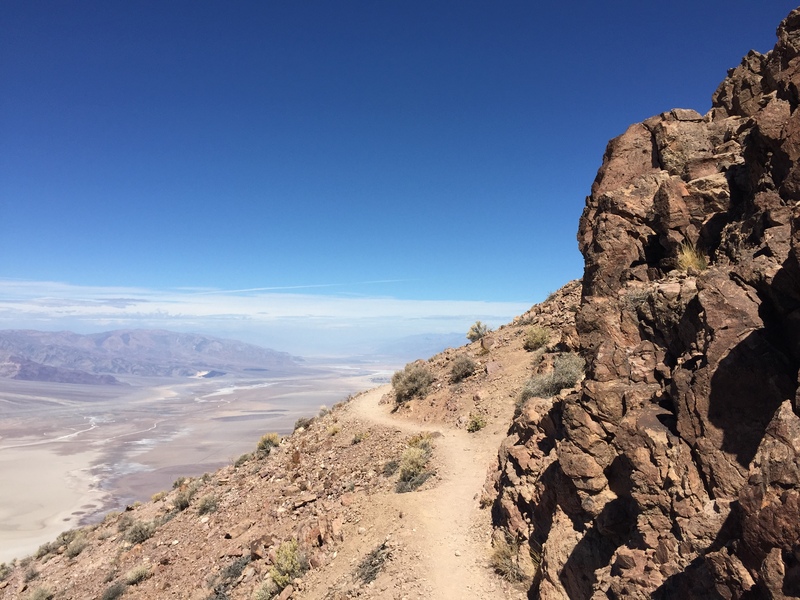 By the time I left Death Valley and reached my mid-day destination at Lone Pine, CA, I had spent two or three hours longer than I intended on the route. Granted, I made a few stops that I probably could have skipped. In my defense, I was so enthralled with the terrain that I couldn’t resist. Still, I view it all as time well spent. 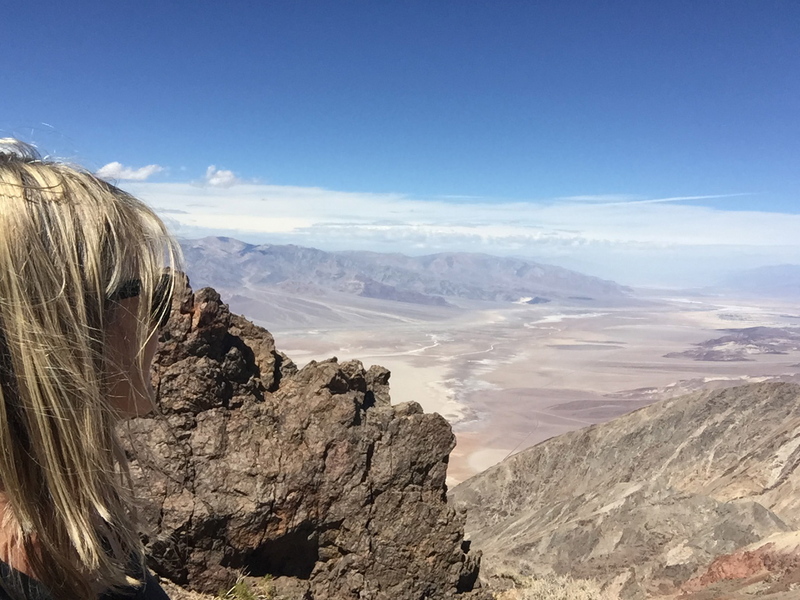 Who knows when I’ll ever get back to Death Valley? Of course, one of the dangers in a quick pass-through is that you see many other detours that you’d love to check out, but must pass up. 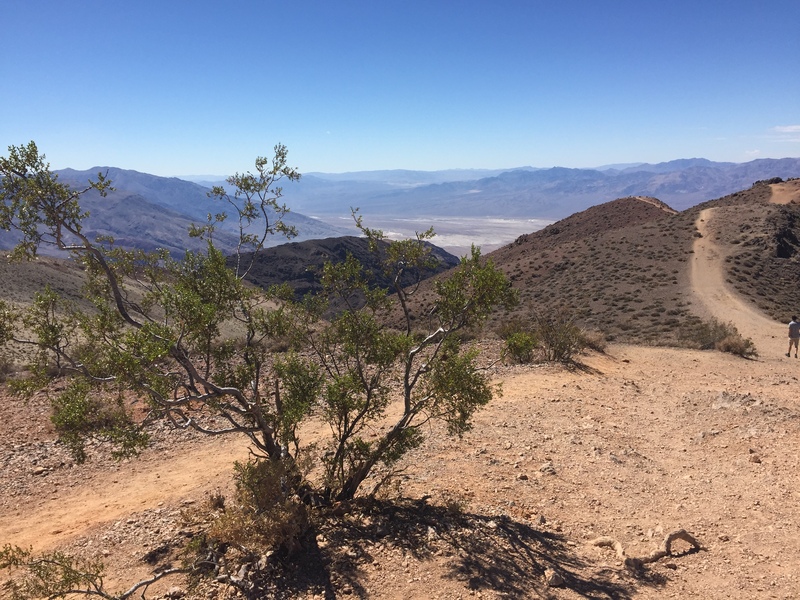 I was tempted by turnoffs for Mosaic Canyon, the Wild Rose Peak Trail, and Stovepipe Wells. But you can only do so much on a detour, right? On my first day of travel, another shorter detour also yielded a very cool outing. As I was setting in for my long drive to Kingman, AZ on I-40 West, I noticed a sign for Route 66. I had always known the section of the historic road was there, but had never taken the time to drive it. That day, with semi-trucks closing in on me on all sides on I-40, Route 66 sounded wonderful, and I made a snap decision to exit toward Seligman, AZ. 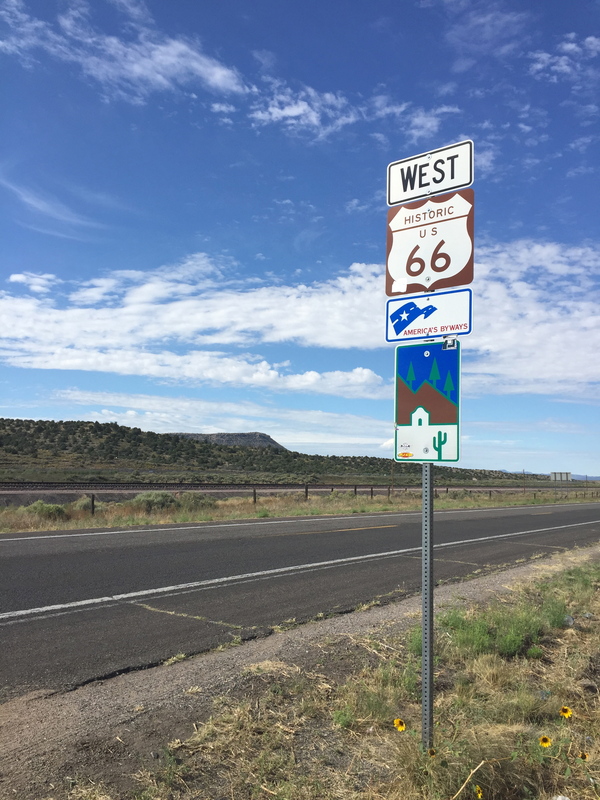 Route 66 turned out to be almost deserted on that Sunday morning, and I loved meandering slightly north of the interstate and taking in the wild-west views of the old “Mother Road. 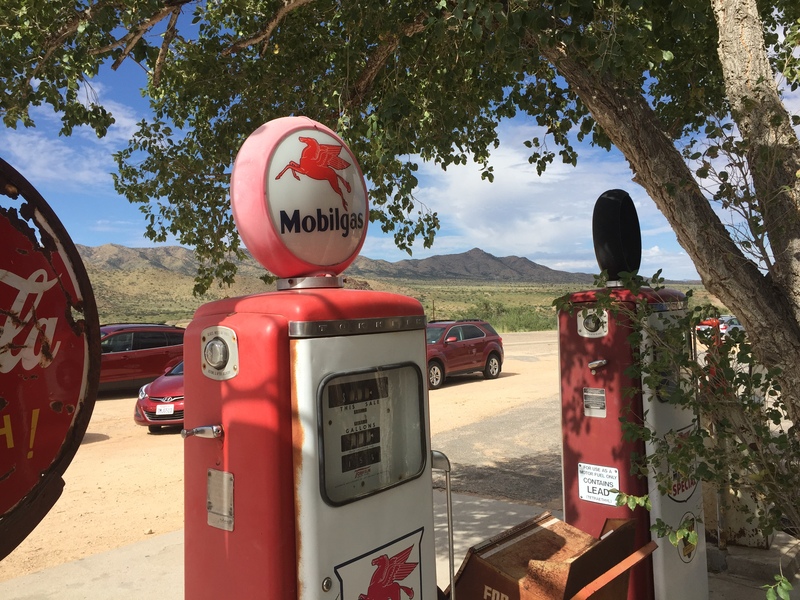 “ Not far from Kingman, I noticed a cluster of parked cars ahead, and slowed down to see the Hackberry General Store. I stopped and wandered through the old-school gas station, store, and restored diner. It was adorable and well worth the stop. So I would have to say that detours served me well on the first leg of my trip. Although I stuck closer to the planned route on the next legs of the trip, I ended up adding plenty of stops along the way. 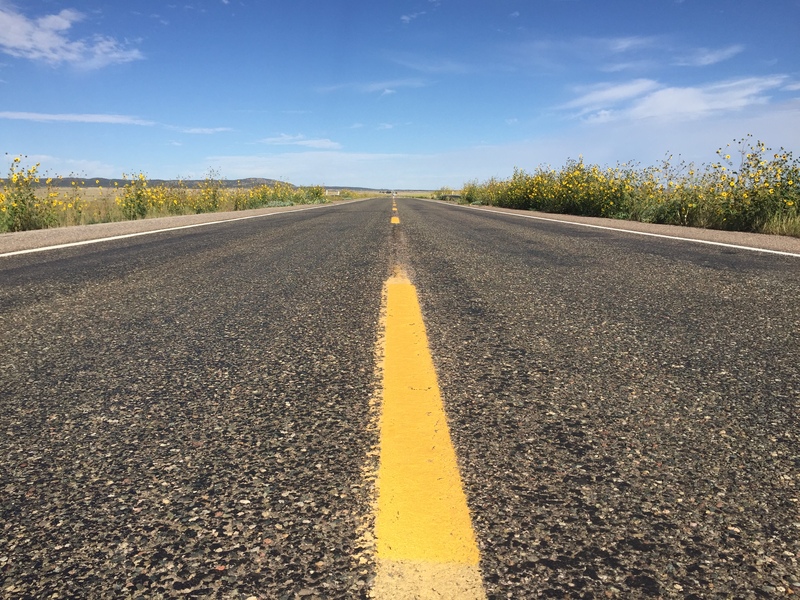 Detours and unplanned stops – they’re what make a road trip magical. I must say my original route looks somewhat tame, compared to what I ended up doing.